Head under the water and go back in time to ancient Egypt and Rome with the new releases from Ainsworth , WMS and Blueprint Gaming. Powered by Ainsworth, Dolphins comes with 5 reels and 30 paylines – you can play from £1.20 per spin across all devices. Set underwater, this simply designed slot game sees shells, pearls, tropical fish, treasure chests and golden galleons on the reels. The dolphin symbol is the wild and replaces all symbols (except the scatter) – it can also appear stacked. Dolphins comes with a Free Games feature where you’ll play with up to 15 free spins and up to 100 times your take (for 5 coin scatters). The stacked wilds also appear on the 3 middle reels for bigger payouts. For more details, read the Dolphins review. You can only play Ainsworth’s Dolphins at BetVictor Casino for now – deposit just £10 to get £50 worth of bonuses. Powered by WMS, Desert Cats is a 7 reel, 50 payline slot game which takes you back in time to ancient Egypt. Graphically quite simple, you will see ankh crosses, stone tablets, death masks and the goddess Bastet on the reels. You’ll also see an Egyptian woman who is the most rewarding – 7 on a payline will reward you with 200 times your stake. There’s also a cat wild which pays the same as the Egyptian woman – the wild can appear as a single symbol or 2×2 symbol for enhanced wins. Look out for wilds containing red gems as 6 of more will reward you with a fixed jackpot. If you get 10 red gems, you’ll win 2,000 times your stake. There’s also a Free Spins Bonus feature where up to 55 free spins can be won – you’ll also benefit from wild reels. To find out more, check out the Desert Cats review. Powered by Blueprint Gaming, Rome: Rise of an Empire comes with 5 reels and 20 paylines. Set within a Colosseum, you join gladiators in this ancient Roman themed slot game where there are plenty of bonus features. You can play from just 20p a spin on all devices. There are 5 randomly triggered features which reward you with symbol drops, stacked wilds, transforming symbols with multipliers, streak spins and bonus scatters to trigger the main features. With 5 main bonus features, you can win cash prizes in 2 of them. There’s a Volcanic Cash Free Spins feature where multipliers up to 5x apply – on your last free spin, a multiplier up to 10x will be applied. The Empress’s Treasure Free Spins feature gives you 15 free spins with an expanding Empress Wild – they will give you a cash prize or a sticky wild reel. Lastly there’s the Big Money Bonus feature where you can win huge cash prizes. For more info, go to the Rome: Rise of an Empire review. 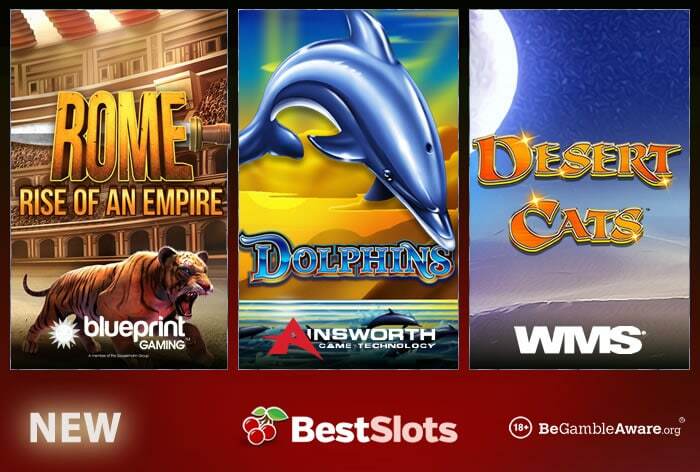 Both Rome: Rise of an Empire and Desert Cats are available at many online casinos – I recommend you play it at Videoslots Casino who have also released NextGen Gaming/Chance Interactive’s Buster Hammer Carnival and Playtech’s Tiki Paradise today. Sign up to get a 100% first deposit bonus up to £200 plus 11 wager-free extra spins on Net Entertainment’s Starburst.